Raiding | A Song for the Horse Nation - October 29, 2011 through January 7, 2013 - The National Museum of the American Indian - Washington, D.C.
Capturing an enemy’s horses became a key tactic of warfare among many western tribes. Young men would risk life and limb to enter enemy villages and take a prized horse staked near its owner’s tipi. Capturing an enemy’s horse was an achievement meriting praise and honor from family and friends. Returning from a successful raid astride a fine horse, a proud young man often gave his prize to a widow or other less fortunate member of the community, displaying generosity as well as bravery. The raiding party spies on the villagers, waiting for them to go inside their tipis so they can take their horses. The drawings may depict one man executing several raids. Raiding an enemy’s horses is a tradition that survived even into 20th-century warfare. On the Apsáalooke (Crow) Reservation in southeastern Montana, Dr. Joseph Medicine Crow, now in his 90s, tells a story of modern horse-raiding. Joe grew up listening to the stories of his grandfather White Man Runs Him and the other aged veterans of the Indian wars. During World War II, he got the chance to capture his own horse in the finest tradition of a Plains Indian warrior. 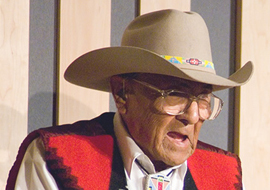 Listen to Joe Medicine Crow tell his story.